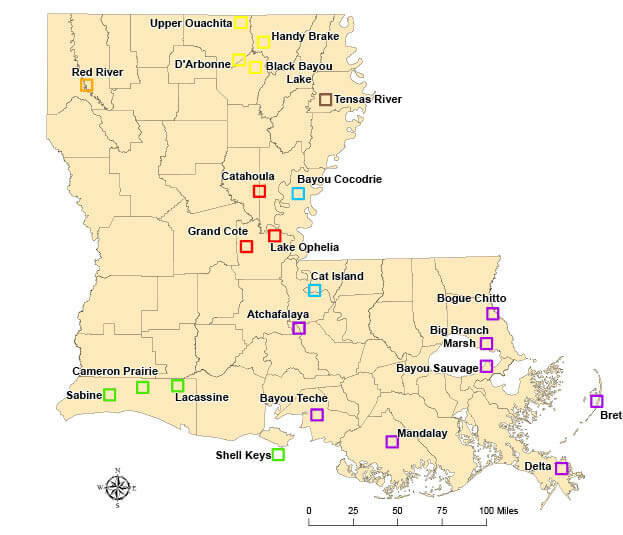 There are 23 National Wildlife Refuges located within Louisiana, occurring in 29 parishes and encompassing over 550,000 acres. Refuge Permits are required for hunting each individual refuge unit. Refuge-specific regulations may differ from Louisiana general regulations and/or WMA regulations. Please consult refuge-specific brochure/hunt permit for appropriate regulations. Permits or additional information may be obtained on the internet or by contacting the Refuge Complex office that administratively manages the refuge(s) you are interested in hunting.